Oooh do I have the most beautiful and elegant kit to show you. Rustic Winter is Courtney's Digiscrappin' newest kit and it just took my breath away. First thing that hit me was the gorgeous colours. Crisp whites and greys, a tiny hint of brown and the most lucious red. The elements are a mix of paper style and realistic, and the papers are beautifully grunged and patterned with some scene backgrounds too. This is definitely one versatile kit to add to your stash. It lends itself to Christmas layouts, winter layouts, everyday scrapping and even for wedding/special occasion layouts. There is such a great mix of traditional styles and "scene" styles this kit is sure to please you whatever your style of scrapping. The second page I made is a bit more traditional and features the gorgeus realistic elements as a cluster: Template is from Designed By Ellie at the Den, it was from the forum sketch challenge. You can get all this stunning work of Courtney's at Angel Baby Scraps or The Den for only $2.25....be quick as it wont be on sale for long! If you head over to her blog, there is a gorgeous freebie cluster frame waiting for you. And today I have a quick page for you made from my second layout above. Thanks for your post Kelly-Jo and awesome freebie! Thank you so much for this post. 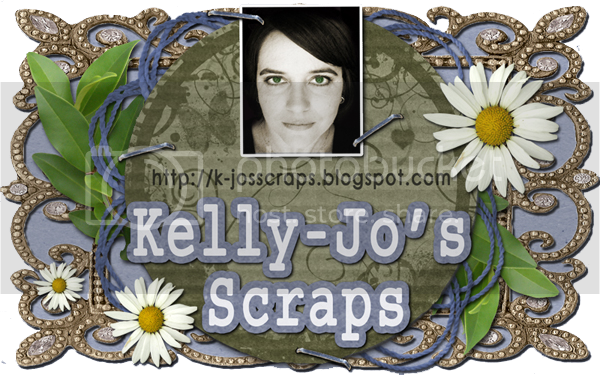 I want to let you know that I posted a link to your blog in CBH Digital Scrapbooking Freebies, under the Page 2 post on Nov. 16, 2011. Thanks again. Thank you so much for sharing your GORGEOUS QP with me.LOVE IT!! Absolutely gorgeous QP .... thank yoou!